For the final of Designing for Live Performance we were asked to take the show Privacy, debuted at the Public Theatre in New York, choose an interaction and redesign it. Our group decided that we were interested in approaching the interaction where the audience members were tracked via google maps from their cellphone GPS data. We wanted to take a slightly different approach by transitioning the Researcher on stage to become a Hacker and show how easy it is to hack the systems and cameras in place to attempt to keep us safe around the city (ex. surveillance cameras). Lindsey Piscitell, Jiyao Zhang, Jeff Park and I partnered up to work on this project, and decided to write a new scene involving the relative ease in which one could hack IPCameras to spy and infiltrate an individual. 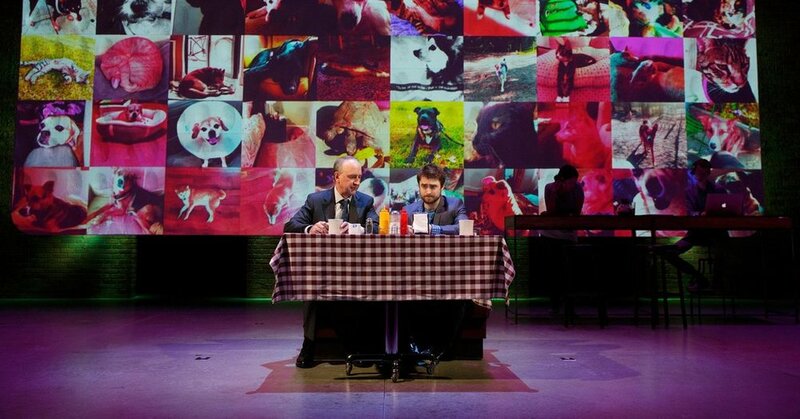 Privacy is a play about vulnerability. Privacy is about the power that we possess in surveilling others and how much is left to the discretion of the individual with that power. The evolution of technology has led to a Pandora’s Box of potential violations into the personal and private lives of the citizens it was built to serve. Publicly, we are at the discretion of regulation on a policy level. Privately, we remain at the whim of those we choose to trust, who have more access to and power over our data than ever before. How do we negotiate the ability to trust with the ability to define your own identity? How can we mitigate the legacy of online profiles that will long outlive our actual lives, and the hold the “powers that be” have over the information we most likely don’t know we’re even making public? The world is in the hyper present. The mood is cold, dark and paranoid – we are at the edge of absurdity. Time and space are undefined. Technology drives the world forward. Moments that are mostly sinister are dominated by stark black, white, and red. Moments that are more familiar are colored in blue, (or warmer) bright light. We conducted some visual research to inform our decisions on the mood, content, and context of our piece. You can peruse our Visual Research presentation here. Ultimately, we decided to rewrite a scene from Privacy using face-tracking and surveillance cameras, as we wanted to use a widely controversial issue/technology in 2017. With the proliferation of surveillance tools like nanny cams, Alexa, etc. as well as the increased use of face-tracking technology like FaceID in the new iPhone X, we thought that these issues would help produce a compelling scene that would hit the point home on how vulnerable we are to unwanted surveillance. Once we had a general idea of what issues we wanted to tackle, we wrote two new scripts for our scene. In order to maintain believability, we decided to use a plant critic as our “target.” In our play, we would increasingly intrude upon the personal life of our “target”, obtaining surveillance footage of her ID, her daily routine, her home, and even her family. In our script, the NYPD Police Commissioner, William Bratton, along with the CTO of Persistent Surveillance Systems, Andrew McNutt, would give a presentation on the latest surveillance technology roaming the city. In the demonstration, things would begin smoothly, but our presenters would slowly begin to lose control of their surveillance technology as the presentation continued. Their presentation would get hijacked by increasingly more personal footage of our “target” guest critic, and the ensuing chaos would demonstrate the vulnerability and danger that any individual could face from this technology falling into the hands of a malignant player. Scripts can be found here: script A, script B.